Luckily, I'll be making my own from now on with this recipe! This month's Recipe Redux Challenge asked for recipes that used honey or syrup as a sweetener alternative. Just coming off of a urban bee keeping obsession ( listening to a book on urban farming in my car), I knew I wanted to work with local honey. You can visit your local market for specific flavors of honey depending on what the busy bees are frequenting. I've seen clover, lavender and more! Talk about options. Add sugar and honey in a sauce pan. Bring mix to a simmer at medium heat. Add almonds, stir with rubber spatula and turn constantly for three mins until glossy. The mixture will develop a syrup texture. 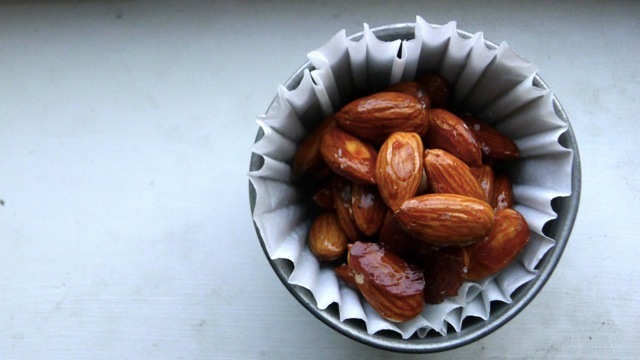 Remove almonds and syrup from the sauce pan and spread onto parchment on a sheet pan. Aim to create a single layer. Put into the oven at 325 degrees for 15 mins or when the mixture has darkened. Turn almonds with spoon every four to five minutes during cooking. Let cool once removed from oven and top with additional sea salt. Looking to spice things up? Add almonds to a bag with either cocoa powder (far right) or cinnamon sugar (middle) and shake to coat. There you have it! Perfect car snacks that won't cost you multiple appendages. These have been my saving grace during the culinary road trip endeavor these past weeks. The protein and healthy fats keep me full and give me energy for longer than a typical fast sugar fix. Want more honey and syrup recipes to sweeten your spring? Check them out below! Recipe Redux is the ONLY recipe contest run by Registered Dietitians, so you're sure to grab some great recipes!